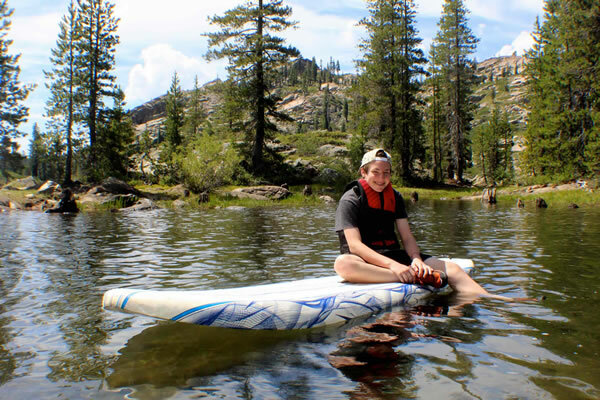 The Summer Camp is located just 10 minutes from the Lakes Basin Recreation Area, which has over 70 pristine mountain lakes and where we run much of our aquatics program. 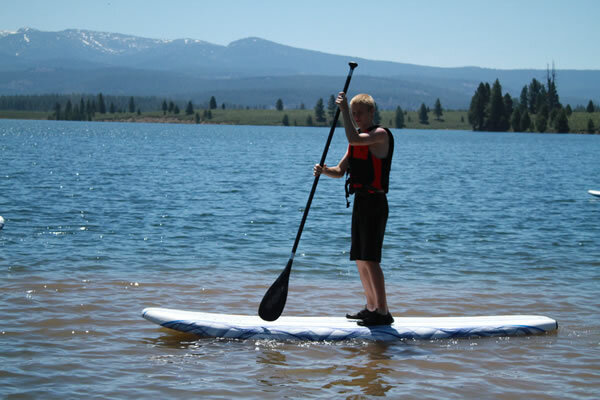 We'll also run activities at a few of our other favorite lakes such as Deadman's Lake and Stampede Reservoir and possibly even Donner Lake. 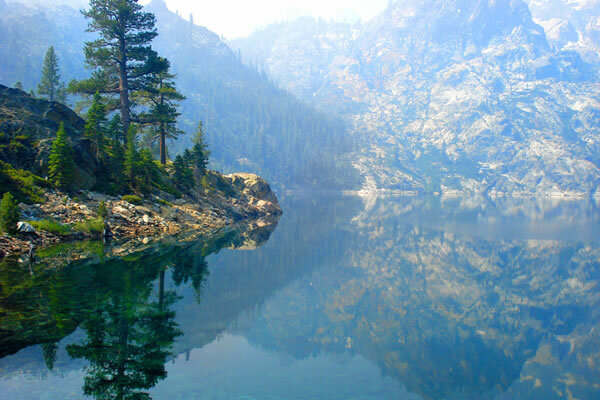 You won't get bored with just one lake, but will have many to explore. 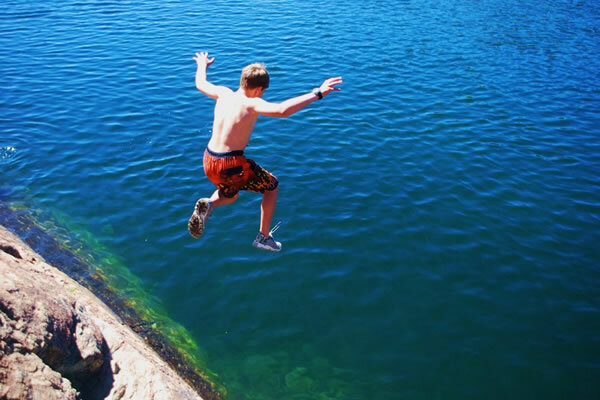 Rock jumping is a time-honored camp activity. 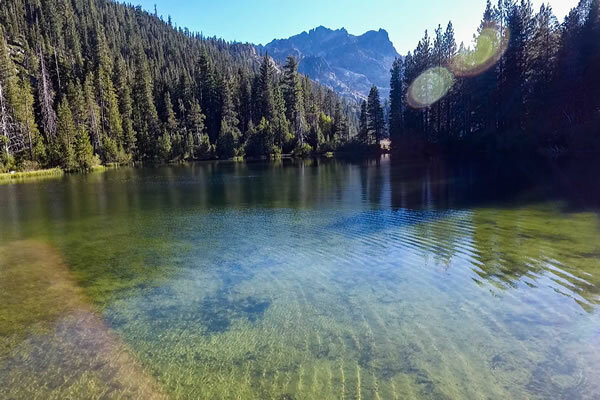 We'll swim or boat over to the island in Salmon Lake or hike up to Upper Sardine Lake to visit two of our favorite spots. 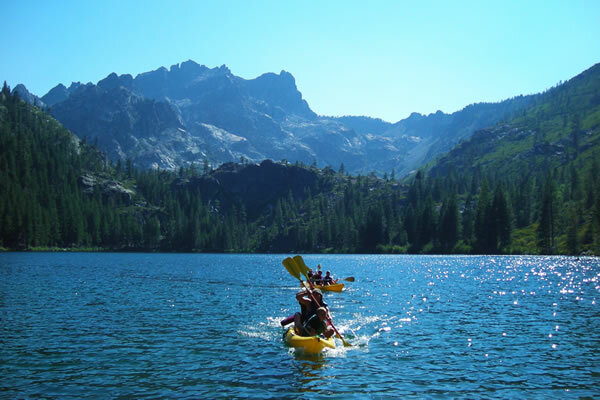 You'll also be able to go kayaking on lakes, including Lower Sardine Lake and Salmon Lake. The kayaks we use are open "ocean" type kayaks that can take 2 or 3 people. 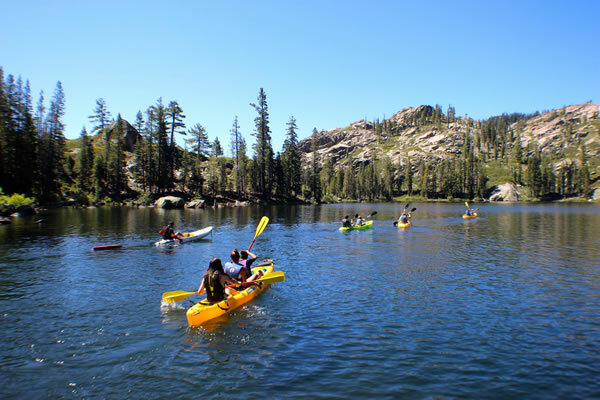 During our sessions of two-weeks or longer, we may mix up our destinations, which could also include Stampede Reservoir and Donner Lake. Our favorite kayaking trip is across Sardine Lake followed by a short hike up the feeder stream to a 40' hidden waterfall for a good scrub! This is an enormously popular activity. You'll climb aboard what looks like a very long surf board where you can sit, kneel or stand. This is actually great exercise, working your core and arms and helps improve balance. It also offers a unique perspective of the lake and shoreline. 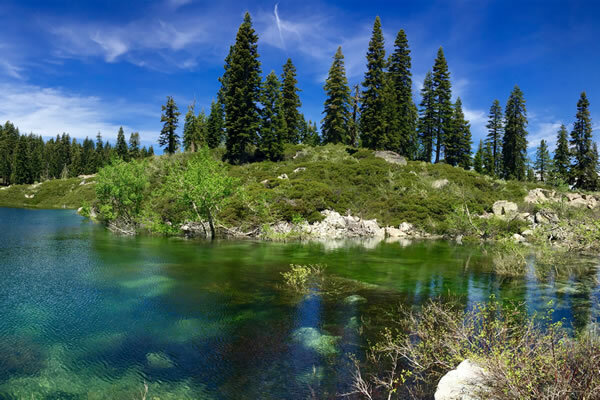 Upper Sardine Lake is very dramatic. 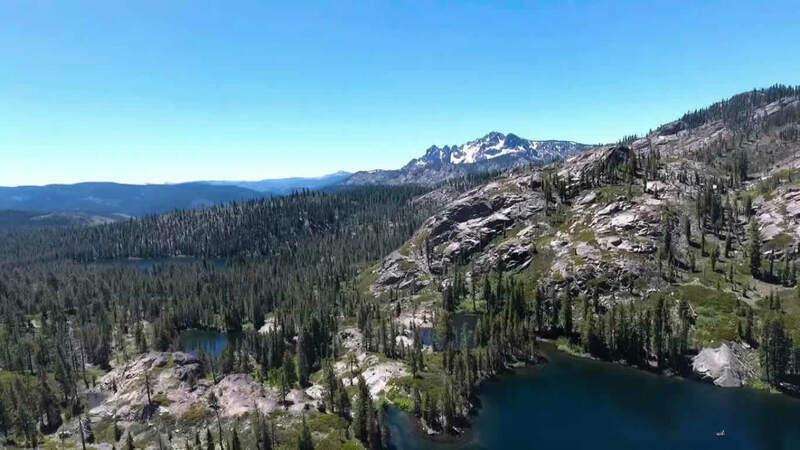 It's upstream of Lower Sardine Lake by about 1/10th of a mile (0.2 kilometers) and is tucked right against some tower granite walls of the Sierra Buttes. It's great for the views and rock jumping in addition to swimming. Stampede Reservoir is bigger than either Sardine or Salmon lakes. It has a beautiful and varied coast line and a couple islands. It has a camp ground from which we occasionally run an overnight trip where we'll kayaking and paddle board. Sand Pond is sandy beach lake is shallow and warms up nicely, making it a terrific place to cool off and go swimming. 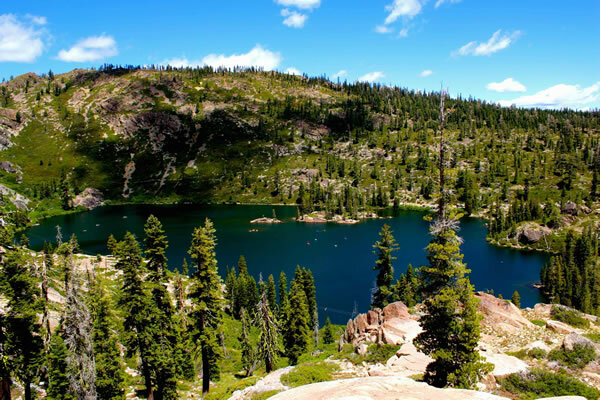 Volcano Lake is another hidden treasure, located on the ridge above Lower Sardine Lake. It's one of our destinations for day hikes and overnights. 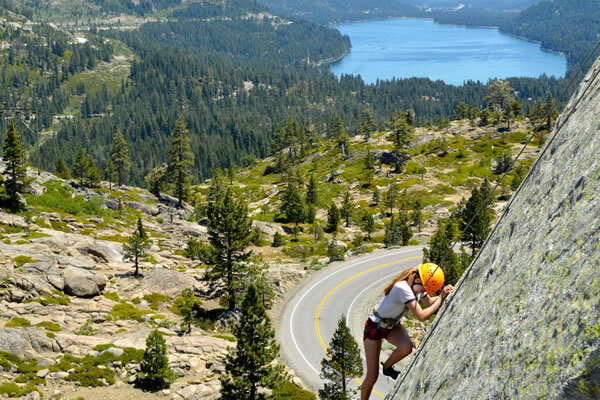 Donner Lake was made famous by the ill-fated Donner Party which tried unsuccessfully to cross the Sierra Nevada mountains by wagon train in the 1800s, this large lake provides a beautiful view for you while rock climbing. If you like to paddle, you'll have lots of shoreline and inlets to explore. A sandy beach also is ideal for launching our windsurfers. The Camp runs a full day trip to this lake only during our sessions that are two weeks or longer. Deadman's Lake is located at the end of a scenic 2 mile (3 kilometer) trail from Camp, this high Sierra lake is tucked under Deadman's Peak (who would've guessed?) and off the beaten track. We rarely see other people at the lake, and it's great for taking a dip after the hike. We might also run an overnight camp-out under the stars here. 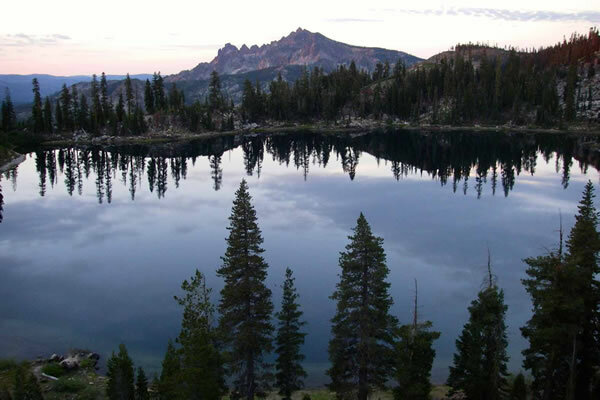 Deer Lake is in the heart of the Lakes Basin Recreation Area. 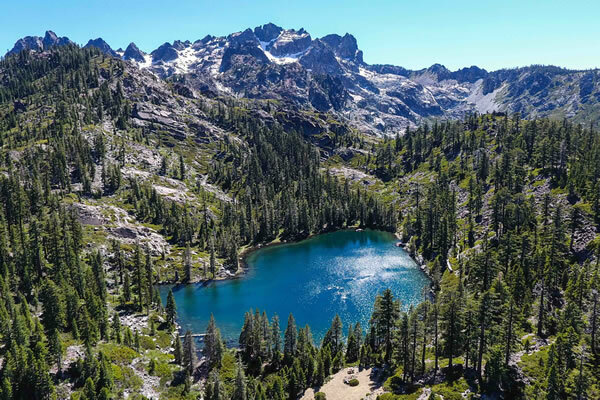 It's a favorite destination for short hikes, overnights, and a way-point for longer backpacking trips.